Matthew luhn developed this fun and easy-to-follow method of drawing and cartooning over the past 15-year of teaching cartoonists of all ages. Filled with techniques and lessons including shapes, shading, perspective, dimension, developing, style, writing, stories and creating morphing effects in flip books these books and kits are ideal for teachers, students and aspiring cartoonists alike. If you are interested in comic arts, cartooning, animation sequential arts, graphic arts, novels drawing or just having fun, these kits are for you. Kit include two lesson booklets, one sketch book, one drawing pencil, eight colored pencils, one black layout pencil, one sharpener and one plastic eraser. Contents conform to ASTM D4236. Made in USA. 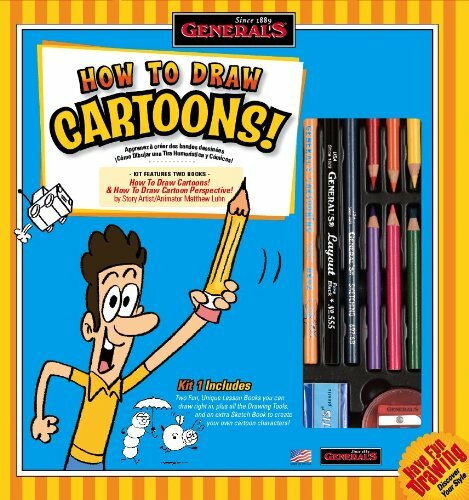 2 Step-by-step how-to cartoon books by Matthew Luhn included. Pencils handcrafted with sustained yield incense cedar wood. If you have any questions about this product by General Pencil, contact us by completing and submitting the form below. If you are looking for a specif part number, please include it with your message. AVELLIM Watercolor Portable Paint Set, 24 Lightfast Vibrant Colors, for Artists, Beginners, Kids - Includes Two Refillable Water Brushes and Mixing Palette. Proart Sketch Combo Pack with 11x14" Sketchbook & 30 Piece Pencil Set!